There are many additives that can be used to enhance the yield of flowering crops. Some have been covered in this blog - like silicon - while others haven't been mentioned here. Today we are going to talk about a rarely discussed additive that is infrequently used in plant culture these days: Titanium. I want to talk about this additive in light of a literature review that came up recently (April 2017) about the use of Titanium in crop production. The magazine where this review came from (Frontiers in Plant Science) is a magazine that often has good content in the field of innovative crop enhancing techniques. Titanium use in plant culture is not new. From the early 1980s people started to experiment with titanium as techniques were developed in order to produce titanium chelates that could be used in foliar applications. Basically all reports of yield increases - that show wonderful increases up to even 95.3% in yields - come from a paper on the biological importance of titanium by Dr. István Pais in 1983 and then another publication in 1991 by the same person (here). Other authors have also showed increased yields (here and here) although in some cases in conjunction with other additives (like Si) with results often much less dramatic than the initial 1983 papers. Titanium nanoparticles have also been tested and their effect has mostly been negative with decreases in plant growth and often DNA damage. For this reason when using titanium you want to go with a soluble chelate and not nanoparticle sources. Creating aqueous stable Ti is not a cake walk. There is currently only one product that carries water soluble Ti (called Tytanit) and as far as I can tell no other commercial products for the application of Ti exist at this moment. This tytanit product is most probably titanium ascorbate - the most popular chelate used - but other organic chelates, like Ti citrate, might be usable as well. Preparing Ti ascorbate is not so easy to get as well - you cannot just buy it on ebay/alibaba as it's not stable as a solid - so you need to prepare it from scratch. Titanium chemistry in solution is complicated as you can see in this detailed article about Ti (IV) chelates in solution (image below taken from this paper's abstract). However there is probably a route to the easy preparation of such complexes using a simple method involving titanium dioxide and ascorbic acid. We know from dissolution studies of titanium dioxide that it can be dissolved significantly by ascorbic acid but the final concentration of these solutions is not very high with a final concentration of around 0.025M of Ti possible in solution using this method, with a surrounding concentration of 0.15M of ascorbic acid. More acid does not help dissolve more titanium dioxide as this seems to be the solubility limit of the titanium complex. This gives you around 1.2g/L of Ti which you need to dissolve 500-1000x to arrive at the recommended application rate of 1-2 ppm. This will give a final ascorbic acid concentration of 26ppm which is acceptable as an additive as well. Obviously there are some further formulation steps necessary to get the above to work correctly but this outlines the basics to develop a concentrated titanium ascorbate product that can be used for the creation of a Titanium supplement. Industrally this can be achieved much more efficiently with the use of titanyl sulfate which is a readily soluble and easy to get industrially - but hard to get for your home - form of titanium. You can see this patent for examples of how a fertilizer using titanyl sulfate can be prepared. Evidence about titanium - applied as titanium ascorbate in a foliar spray - being positive for crops is significant. 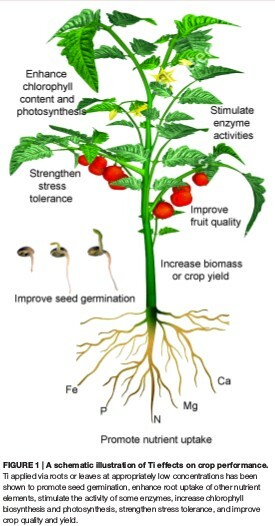 Various positive effects have been shown across a significant variety of plants across several different plant types - tomatoes, beans, peppers - by different authors. The effect on yields is not so clear - probably in reality not as large as shown in the original studies, but probably significant enough to warrant further studying. The development of low-cost processes for the manufacturing of titanium fertilizers will further enhance their use and increase our knowledge about their true capabilities. More studies with ascorbic/ascorbate controls will also show us clear evidence of whether we are seeing effects related with the ascorbate or the actual Ti chelate. If you are interested in learning more about how to prepare a titanium formulation for foliar spraying please feel free to book an hour of consultation time through the website.